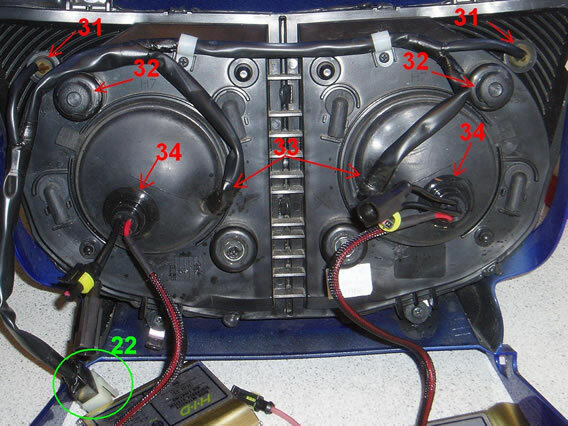 with the dark nights coming in next week Ive noticed that my headlights are all over the place, the handbook shows an adjuster knob on the left hand lamp for vertical adjustment is the knob on the right hand lamp for horizontal?? . some enlightenment would be most welcome. .
Don't have my handbook handy, but if I had to hazard a guess I would've thought there would be two knobs for each lamp. Once you have established which way to turn the knob, you will have to turn it for 4 hours, only joking but you do have to turn it many times to move the lights a small amount, i did mine by putting hands up the fairing from the front by fork leg and turning the knob with the tip of fingers on both hands. Hey Ged,thanks for the info. That wood explain why nothing seemed to move after adjustment,from the photo it looks as the whole thing is one piece rather than two separate units . thanks for the photo,it makes things a lot clearer.now its back on the hands and knees for another fiddle . Hey Nuff,thanks for the advise just realised the pic was yours .relay good clear pic at least now i will no which bit to fiddle with . Not my pic. I stole it from the articles section. Hold on a minute you blokes! So which is the vertical adjustment then, the top or the bottom one? The knobs marked 32 in the picture. I don't know what the other ones are. I think I may have added confusion to the mix, and they're fixings rather than adjustment knobs. There's no mention of horizontal adjustment. Presumably the left knob marked 32 adjusts the dip beam up and down and the right hand knob adjusts main beam up and down. As Nuff says, Its the ones numbered 32, i`m not so sure there is horizontal adjustment available..